What does it mean to embrace? What does it mean to feel embraced? What is it that you truly embrace? Do you wake up and embrace your coffee cup and morning show? Do you embrace fun family vacations and happy times with friends? Do you embrace struggles and tough circumstances and in those moments, walk in the grace we have been offered? Life lends itself to series of events, and we must learn to embrace the journey and partner with God in His plans for our life. Join us for our annual women’s retreat as we dive into the life of Hannah and find out what it means to encounter God and walk in His promises. Throughout the weekend, we will spend time in His word, fellowshipping with other women, crafting and partnering in a service project to benefit foster children – while most importantly, learning to embrace. Lauren was born and raised in Atlanta, Georgia and now resides with her family in Marietta. 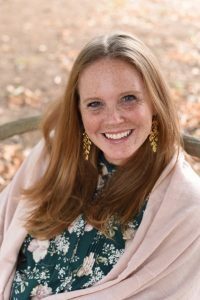 She spent over five years working with a nonprofit who focuses on family ministry, has served as a mission trip coordinator and currently serves in her church as a small group leader. Her passion is her family, finding God in the little details of life and helping others to see God’s love for them. She and her husband Comer have four kids; Anne Margaret (7), Comer (4), Mills (3) and Chapman (1) – and a dog named Champ. Lauren is an avid runner and coffee drinker and enjoys traveling, DIY attempts and writing. She writes a family friendly blog where she unabashedly shares of their adventures, messes and stories of faith. She dreams one day of becoming a published author and has been featured in a variety of local magazines as well as done TV spots upon request. *What does your cost include? 2 night lodging at the Dillard House, 2 full breakfast, 1 full dinner, conference room and equipment, guest speaker, crafts, and service project.